Black Heart Bart was looking to be the first horse to claim back to back wins in the Darley Goodwood in over 100 years. The 1200m sprint run is now worth $1 million, making is one of South Australia’s most lucrative races. The Group 1 race, held at Morphettville, was likely to be the gelding’s only run for the campaign. Trainer Darren Weir says that his intentions were to send the gelding for another break after Saturday’s race in preparation for the Spring. Speaking to the press, Weir said that it was the plan all along, to give Black Heart Bart just a single start. According to Weir, the weight scale really suits him, and there is the attraction of the $1 million prize money which certainly helps. Since Joining the Weir Stables, Black Hart Bart has racked up an impressive record with 12 top-two finishes in his last 13 starts. The only failure for the gelding came in the 2016 Cox Plate. A total of 11 out of the 13 runs have been in Group 1 races with five victories. The first victory in his run came in the 2016 Goodwood race. Weir believed Black Heart Bart could do it again, but in the end was proven wrong. He said that he was in the same sort of order as the 2016, with a slight possibility that this year is a little stronger. The only concern Weir had was that he was going to have a fair amount of traffic to get through as the horse performs at his best back midfield. For jockey Brad Rawiller, the task was the same as 2016, to get the gelding into the clear as early as possible after jumping from the second barrier. But this was not to be. 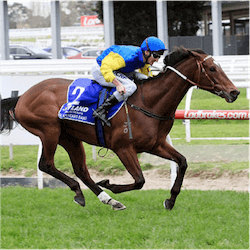 Black Heart Bart was the favourite for the $1 million race at odds of $3.50, ahead of Vega Magic at $6.50 and Secret Agenda at $7.00, but it was Vega Magic who had the best run and placed first.